Listening skills are so important! Before you can effectively teach procedures and academic skills, your students need to listen and attend to what you are saying. 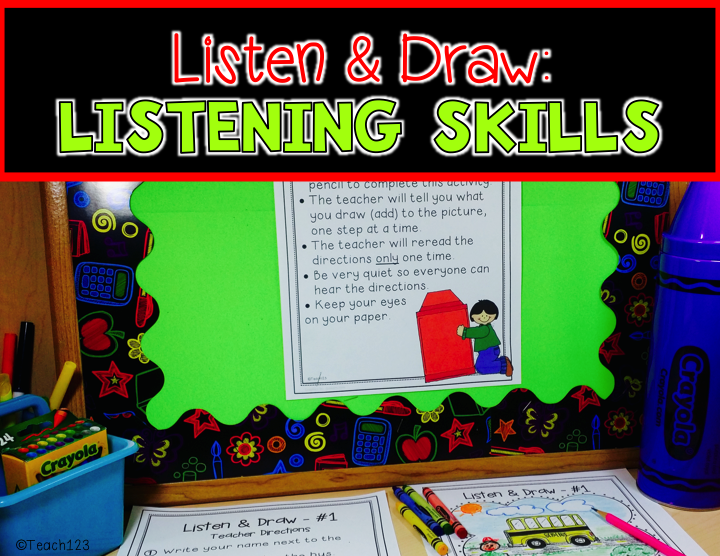 Last year, I wrote a blog post with a listening activity to show what I did at the beginning of the year. 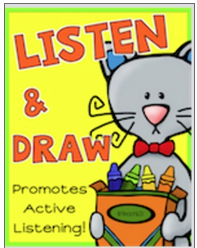 Teachers emailed me asking for more of these listen and draw activities. 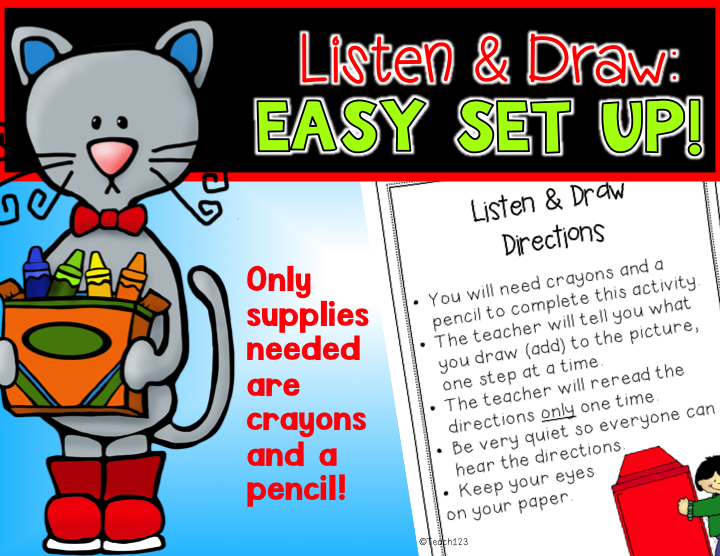 I now have a series of Listen and Draw activities that you can use throughout the year. Plus a FREEBIE for you try. Go over the directions and then hang the sign in the graphic above as a reminder. This is an easy prep activity. The only supplies your students will need are the assignment, crayons, and a pencil. This lesson is from the first packet that I made. It can be used at any time of the year. Many of the topics are school related so they are perfect for Back to School time. 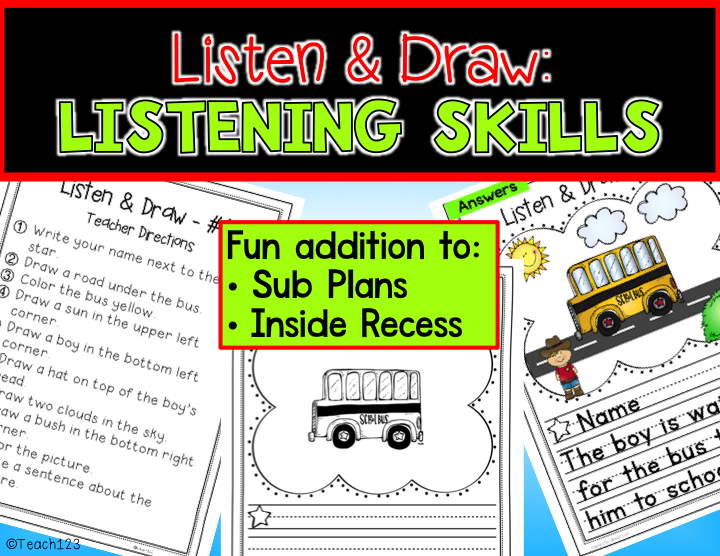 Or add these lessons to your sub plans or do them at your next inside recess. 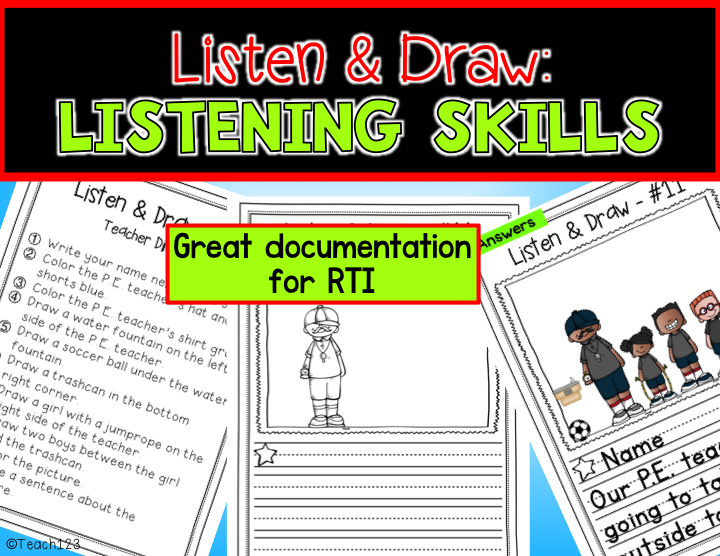 You can also add these listening skills lessons to your students’ portfolios. 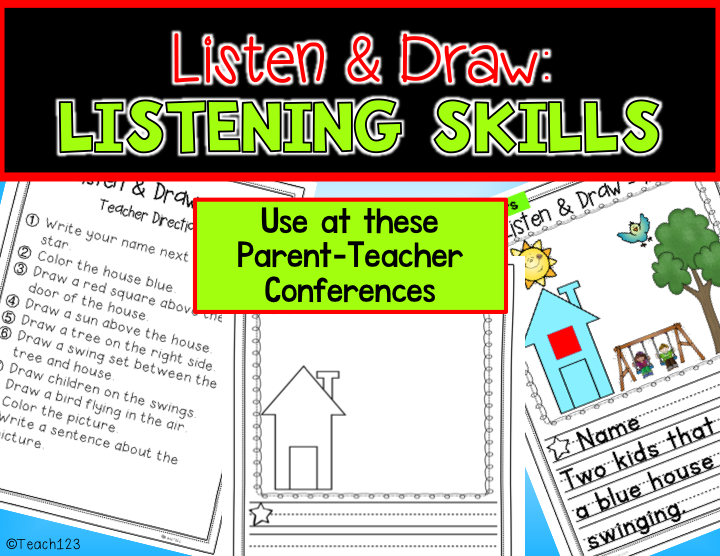 They are great documentation and useful at parent-teacher conferences. These can also be used for RTI. 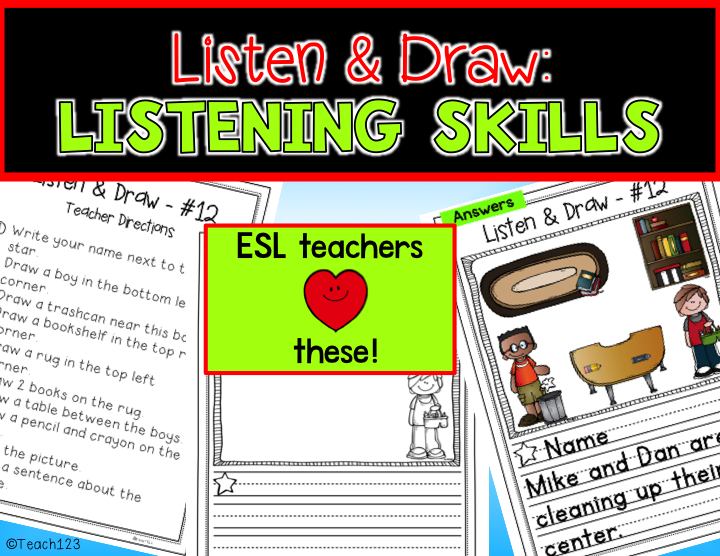 I have gotten great feedback from ESL teachers! 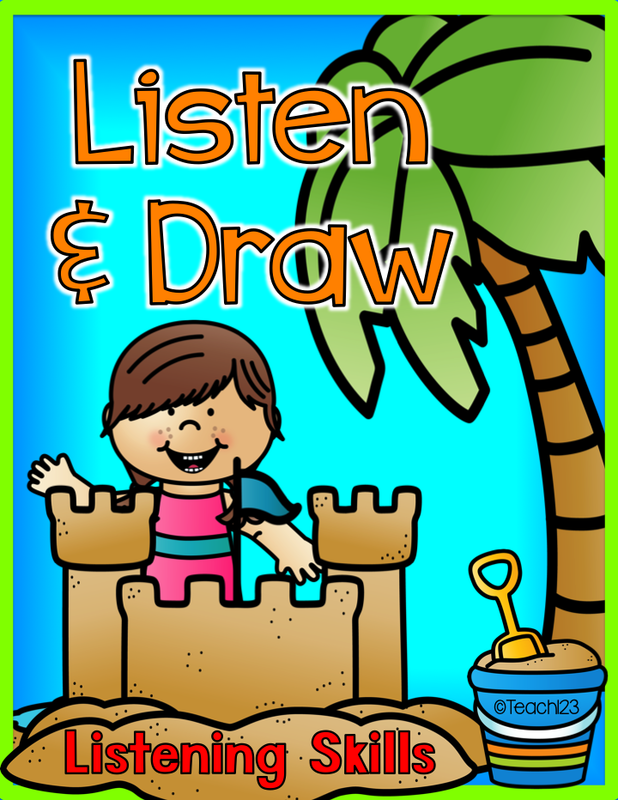 The lessons in the pictures above are from this Listen & Draw. Bundle: includes all except for the Christmas packet. Click HERE to check out the bundle. I plan to make holiday themed packets this year and will make a bundle of them at the end of the year. 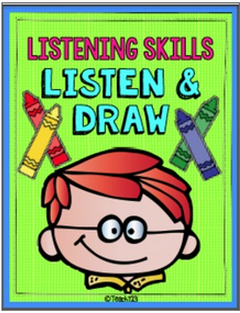 How do you teach listening skills?